A brief explication of the implementation of the Gibbs sampling method via rejection sampling to obtain Bayesian estimates of difficulty and ability parameters under the Rasch model is presented. The Gibbs sampling method via rejection sampling was used in conjunction with the computer program OpenBUGS. Examples that compared the estimation method with another Gibbs sampling method via data augmentation as well as conditional, marginal, and joint maximum likelihood estimation methods are presented using empirical data sets. The effects of prior specifications on the difficulty and ability estimates are illustrated with the empirical data sets. A discussion is presented for related issues of Bayesian estimation in item response theory. Rasch modelinde, madde güçlük ve ayırt edicilik parametrelerinin Bayes kestirimlerini elde etmek için, Gibbs örnekleme yönteminin reddetme örneklemesi yoluyla uygulanmasının kısa bir açıklaması sunulmuştur. Reddetme örneklemesi yoluyla Gibbs örnekleme yöntemi, OpenBUGS bilgisayar programı ile birlikte kullanılmıştır. Bu çalışmada reddetme örneklemesine dayanan kestirim metodu ile veri artırmaya (data augmentation) dayanan başka bir Gibbs örnekleme metodu, koşullu, marjinal ve ortak maksimum olabilirlik kestirim metotları örnek veriler üzerinden karşılaştırılmıştır. Önsel belirlemelerin madde güçlük ve kişi yetenek tahminleri üzerindeki etkileri ampirik veri setleri ile gösterilmiştir. Madde tepki kuramında Bayes kestirimi ile ilgili konular hakkında bir tartışma sunulmuştur. Albert, J. H. (1992). Bayesian estimation of normal ogive item response curves using Gibbs sampling. Journal of Educational Statistics, 17, 251–269. Andersen, E. B. (1970). Asymptotic properties of conditional maximum likelihood estimators. Journal of the Royal Statistical Society, Series B, 32, 283–301. Andersen, E. B. (1972). The numerical solution to a set of conditional estimation equations. Journal of the Royal Statistical Society, Series B, 34, 42–54. Andersen, E. B. (1980). Discrete statistical models with social science applications. Amsterdam, The Netherlands: North-Holland. Anderson, T. W. (1984). An introduction to multivariate statistical analysis (2nd ed.). New York, NY: Wiley. Baker, F. B. (1998). An investigation of the item parameter recovery characteristics of a Gibbs sampling approach. Applied Psychological Measurement, 22, 153–169. Baker, F. B., & Harwell, M. R. (1994). Estimation of item parameters in the Rasch model via conditional maximum likelihood: A didactic. Unpublished manuscript, Department of Educational Psychology, University of Wisconsin, Madison, WI. Baker, F. B., & Kim, S.-H. (2004). Item response theory: Parameter estimation techniques (2nd ed.). New York, NY: Dekker. Barnard, G. A. (1958). Thomas Bayes—A biographical note. Biometrika, 45, 293–295. Bayes, T. (1763). An essay towards solving a problem in the doctrine of chances. Philosophical Transactions (of the Royal Society of London), 53, 370–418; Errara, c. 543. Bayes, T. (1958). An essay towards solving a problem in the doctrine of changes. Biometrika, 45, 296–315. Berger, J. O. (1985). Statistical decision theory and Bayesian analysis (2nd ed.). New York, NY: Springer. Birnbaum, A. (1969). Statistical theory for logistic mental test models with a prior distribution of ability. Journal of Mathematical Psychology, 6, 258–276. Block, A. (1977). Murphy’s law and other reasons why things go wrong! Los Angeles, CA: Price/Stern/Sloan. Bolt, D. M., Cohen, A. S., & Wollack, J. A. (2001). A mixture item response model for multiple-choice data. Journal of Educational and Behavioral Statistics, 26, 381–409. Bolt, D. M., Cohen, A. S., & Wollack, J. A. (2002). Item parameter estimation under conditions of test speededness: Application of a mixture Rasch model with ordinal constraints. Journal of Educational Measurement, 39, 331–348. Bock, R. D., & Aitkin, M. (1981). Marginal maximum likelihood estimation of item parameters: Applications of an EM algorithm. Psychometrika, 46, 443–459. Bock, R. D., & Lieberman, M. (1970). Fitting a response model for n dichotomously scored items. Psychometrika, 35, 179–197. Cai, L., Thissen, D., & du Toit, S. (2010). IRTPRO: Item response theory for patient-reported outcomes [Computer software]. Skokie, IL: Scientific Software International. Chalmers, R. P. (2012). mirt: A multidimensional item response theory package for the R environment. Journal of Statistical Software, 48(6), 1–29. Cohen, A. S., & Bolt, D. M. (2005). A mixture model analysis of differential item functioning. Journal of Educational Measurement, 42, 133–148. Davis, P. J. (1964). Gamma function and related functions. In M. Abramowitz & I. A. Stegun (Eds. ), Handbook of mathematical functions with formulas, graphs, and mathematical tables (pp. 253–293). Washington, DC: National Bureau of Standards. Dodge, Y. (Ed.). (2003). The Oxford dictionary of statistical terms. Oxford, Great Britain: Oxford University Press.du Toit, M. (Ed.). (2003). IRT from SSI: BILOG-MG, MULTILOG, PARSCALE, TESTFACT. Chicago, IL: Scientific Software International. du Toit, M. (Ed.). (2003). IRT from SSI: BILOG-MG, MULTILOG, PARSCALE, TESTFACT. Chicago, IL: Scientific Software International. Fischer, G. H. (1968). Einführung in die Theorie psychologischer Tests: Grunddlagen und Anwendungen [Introduction to the theory of psychological tests: Foundations and applications]. Bern, Switzerland: Huber. Fischer, G. H., & Allerup, P. (1968). Rechentechnische Fragen zu Raschs eindimensionalem Modell [Computational questions on Rasch’s unidimensional model]. In G. H. Fischer (Hrsg. [Ed. ]), Psychologsche Testtheorie [Psychological test theory] (pp. 269–280). Bern, Switzerland: Huber. Fischer, G. H., & Molenaar, I. W. (Eds.). (1995). Rasch models: Foundations, recent developments, and applications. New York, NY: Springer-Verlag. Fox, J.-P. (2010). Bayesian item response modeling: Theory and applications. New York, NY: Springer. Gelman, A., Carlin, J. B., Stern, H. S., & Rubin, D. B. (1995). Bayesian data analysis. London, Great Britain: Chapman & Hall. Ghosh, M., Ghosh, A., Chen, M.-H., & Agresti, A. (1999). Bayesian estimation for item response model (Tech. Rep.). Gainsville, FL: University of Florida, Department of Statistics. Gilks, W. R. (1996). Full conditional distribution. In W. R. Gilks, S. Richardson, & D. J. Spiegelhalter (Eds. ), Markov chain Monte Carlo in practice (pp. 75–88). London, England: Chapman and Hall. Gilks, W. R., Richardson, S., & Spiegelhalter, D. J. (Eds.). (1996). Markov chain Monte Carlo in practice. London, England: Chapman and Hall. Gilks, W. R., & Wild, P. (1992). Adaptive rejection sampling for Gibbs sampling. Applied Statistics, 41, 337–348. Hasting, W. K. (1970). Monte Carlo sampling methods using markov chains and their applications. Biometrika, 57, 97–109. Hoijtink, H., & Boomsma, A. (1995). On person parameter estimation in the dichotomous Rasch model. In G. H. Fischer & I. W. Molenaar (Eds. ), Rasch models: Foundations, recent developments, and applications (pp. 53–68). New York, NY: Springer-Verlag. Isaacs, G. I., Christ, D. E., Novick, M. R., & Jackson, P. H. (1974). Tables for Bayesian statisticians. The Iowa Testing Program, The University of Iowa, Iowa City, IA. Johnson, V. E., & Albert, J. H. (1999). Ordinal data modeling. New York, NY: Springer. Karabatsos, G., & Batchelder, W. H. (2003). Markov chain Monte Carlo estimation for test theory without an answer key. Psychometrika, 68, 373–389. Kim, J.-S., & Bolt, D. M. (2007). Estimating item response theory models using Markov chain Monte Carlo methods. Educational Measurement: Issues and Practice, 26(4), 38–51. Kim, S.-H. (2001). An evaluation of a Markov chain monte carlo method for the Rasch model. Applied Psychological Measurement, 25, 163–176. Leonard, T., & Hsu, J. S. J. (1999). Bayesian methods: An analysis for statisticians and interdisciplinary researchers. New York, NY: Cambridge University Press. Levy, R., & Mislevy, R. J. (2016). Bayesian psychometric modeling. Boca Raton, FL: CRC Press. Linacre, J. M. (2003). WINSTEPS Rasch measurement computer program [Computer software]. Chicago, IL: Winsteps.com. Lindley, D. V. (1965). Introduction to probability and statistics from a Bayesian viewpoint: Part 2, Inference. London, Great Britain: Cambridge University Press. Lindley, D. V., & Smith, A. F. (1972). Bayesian estimates for the linear model. Journal of the Royal statistical Society, Series B, 34, 1–41. Lunn, D., Jackson, C., Best, N., Thomas, A., & Spiegelhalter, D. (2013). The BUGS book: A practical introduction the Bayesian analysis. Boca Raton, FL: CRC Press. Mair, P., & Hatzinger, R. (2007). Extended Rasch modeling: The eRm package for the application of IRT models in R. Journal of Statistical Software, 20(9), 1–20. McDonald, R. P. (1999). Test theory: A unified treatment. Mahwah, NJ: Lawrence Erlbaum Associates. Metropolis, N., Rosenbluth, A. W., Rosenbluth, M. N., Teller, A. H., & Teller, E. (1953). Equation of state calculations by fast computing machines. The Journal of Chemical Physics, 21, 1087–1092. Mislevy, R. J. (1986). Bayes modal estimation in item response models. Psychometrika, 51, 177–195. Molenaar, I. W. (1995). Estimation of item parameters. In G. H. Fischer & I. W. Molenaar (Eds. ), Rasch models: Foundations, recent developments, and applications (pp. 39–51). New York, NY: Springer-Verlag. Neal, R. M. (2003). Slice sampling. Annals of Statistics, 31, 705–741. Novick, M. R., & Jackson, P. H. (1974). Statistical methods for educational and psychological research. New York, NY: McGraw-Hill. Novick, M. R., Lewis, C., & Jackson, P. H. (1973). The estimation of proportions in n groups. Psychometrika, 38, 19–46. Öztürk, N., & Karabatsos, G. (2017). A Bayesian robust IRT outlier detecion model. Applied Psychological Measurement, 41, 195–208. Patz, R. J., & Junker, B. W. (1999). A straightforward approach to Markov chain Monte Carlo methods for item response models. Journal of Educational and Behavioral Statistics, 24, 146–178. Rasch, G. (1980). Probabilistic model for some intelligence and attainment tests (With a foreword and afterword by B. D. Wright). Chicago, IL: The University of Chicago Press. Rizopoulos, D. (2006). ltm: An R package for latent variable modeling and item response theory analysis. Journal of Statistical Software, 17(5), 1–25. Sheng, Y. (2010). A sensitivity analysis of Gibbs sampling for 3PNO IRT models: Effects of prior specifications on prameter estimates. Behaviormetrika, 37, 87–110. Spiegelhalter, D. J., Thomas, A., Best, N. G., & Gilks, W. R. (1997a). BUGS: Bayesian inference using Gibbs sampling (Version 0.6) [Computer software]. Cambridge, UK: University of Cambridge, Institute of Public Health, Medical Research Council Biostatistics Unit. Spiegelhalter, D. J., Thomas, A., Best, N. G., & Gilks, W. R. (1997b). BUGS 0.5 examples (Vol. 1, Version i). Cambridge, UK: University of Cambridge, Institute of Public Health, Medical Research Council Biostatistics Unit. Spiegelhalter, D., Thomas, A., Best, N., & Lunn, D. (2014). OpenBUGS user manual. Cambridge, UK: MRC Biostatistics Unit, Institute of Public Health. Stigler, S. M. (1980). Stigler’s law of eponymy. Transactions of the New York Academy of Sciences, Series 2, 39, 147–157. Stone, C. A., & Zhu, X. (2015). Bayesian analysis of item response theory models using SAS. Cary, NC: SAS Institute. Swaminathan, H., & Gifford, J. A. (1982). Bayesian estimation in the Rasch model. Journal of Educational Statistics, 7, 175–191. Swaminathan, H., & Gifford, J. A. (1985). Bayesian estimation in the two-parameter logistic model. Psychometrika, 50, 349–364. Swaminathan, H., & Gifford, J. A. (1986). Bayesian estimation in the three-parameter logistic model. Psychometrika, 51, 589–601. Swaminathan, H., Hambleton, R. K., Sireci, S. G., Xing, D., & Rizavi, S. M. (2003). Small sample estimation in dichotomous item response models: Effect of priors based on judgmental information on the accuracy of item parameter estimates. Applied Psychological Measurement, 27, 27–51. The MathWorks. (1996). MATLAB (Version 5) [Computer program]. Natick, MA: Author. Thissen, D. (1982). Marginal maximum likelihood estimation for the one-parameter logistic model. Psychometrika, 47, 175–186. Trader, R. L. (1997). Bayes, Thomas. in N. L. Johnson & S. Kotz (Eds. ), Leading personalities in statistical sciences: From the seventeenth century to the present (pp. 11–14). New York, NY: John Wiley & Sons. Tsutakawa, R. K., & Lin, H. Y. (1986). Bayesian estimation of item response curves. Psychometrika, 51, 251–267. Venables, W. N., Smith, D. M., & The R Development Core Team. (2009). An introduction to R (2nd ed.). La Vergne, TN: Network Theory. von Davier, M. (2001). WINMIRA 2001. Wang, X., Bradlow, E. T., & Wainer, H. (2005). User’s guide for SCORIGHT (Version 3.0): A computer program for scoring tests built of testlets including a module for covariate analysis (ETS Research Rep. RR-04-49). Princeton, NJ: Educational Testing Service. Warm, T. A. (1989). Weighted likelihood estimation of ability in item response models. Psychometrika, 54, 427–450. Wollack, J. A., Bolt, D. M., Cohen, A. S., & Lee, Y.-S. (2002). Recovery of item parameters in the nominal response model: A comparison of marginal maximum likelihood estimation and Markov chain Monte Carlo estimation. Applied Psychological Measurement, 26, 339–352. Wright, B. D., & Linacre, J. M., & Schultz, M. (1989). A user’s guide to BIGSCALE: Rasch-model rating scale analysis computer program. Chicago, IL: MESA Press. Wright, B. D., & Mead, R. J. (1978). BICAL: Calibrating items and scales with the Rasch model (Research Memorandum No. 23A). Chicago, IL: University of Chicago, Department of Education, Statistical Laboratory. Wright, B. D., Mead, R. J., & Bell, S. R. (1980). BICAL: Calibrating items with the Rasch model (Research Memorandum No. 23C). Chicago, IL: University of Chicago, Department of Education, Statistical Laboratory. Wright, B. D., & Panchapakesan, N. (1969). A procedure for sample-free item analysis. 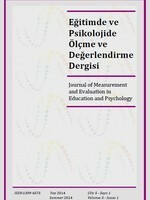 Educational and Psychological Measurement, 29, 23–48. Wright, B. D., & Stone, M. H. (1979). Best test design. Chicago, IL: MESA Press.